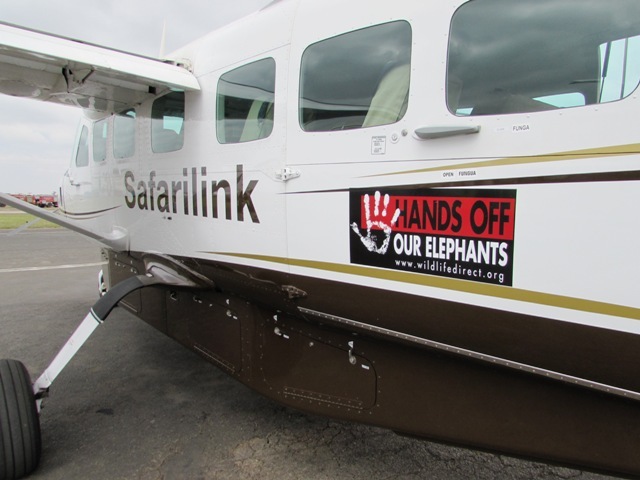 On Saturday 5thJuly 2014, Safarilink flagged off a partnership with Wildlife Direct to support the Kenyan Hands Off Our Elephants campaign by branding all aircrafts with 'HANDS OFF OUR ELEPHANTS' messaging and adopting a policy of no ivory on board Safarilink aircraft. Safarilink, which provides scheduled services to all the major game parks in Kenya, is the first airline to partner with Wildlife Direct to help raise public awareness to stem the trafficking of ivory and other wildlife products. Safarilink Managing Director, John Buckley, said 'Can you imagine Kenyan game parks with no elephants? I certainly can't. But if we all sit back and silently accept the slaughter of these intelligent and essentially peaceful mammals then that will be the reality within the next generation. And our children's children will be using the phrase 'dead as an elephant' rather than 'dead as a Dodo'. He adds: 'Safarilink is fortunate to be in a position to get the Hands Off our Elephants message across to thousands of tourists - the stickers will ensure the message is right in their faces every time they board our aircraft. This campaign is important because Kenya is renowned as a hub for the transiting of ivory and 80% of the ivory exiting Africa is passing through Uganda, Kenya and Tanzania, so the message is intended to reach thousands of travelers who see or travel on Safarilink aircraft. Every year, hundreds of passengers illegally carry wildlife products which are an international crime. Tens of these travelers are arrested in Kenyan airports and many have been sentenced to hefty fines, others have been jailed. Since the enactment of the new Wildlife legislation in Kenya, those in illegal possession of ivory or rhino horn could face up to life imprisonment. Philip Murgor, Director of Wildlife Direct, said that airlines and transport businesses in general have a duty to ensure that their cargo does not contravene local and international laws. The campaign should not only reach tourists, airline and airport staff, but should reach all citizens around the country who can help report illegal activities. More informed citizenry and travelers through the Safarilink in-flight magazine, website, and through educating airline staff, they can provide a better understanding of how buying ivory threatens elephants. Reduction in ivory trafficking in East Africa. More information from travelers who may be willing to denounce wildlife crime and report to authorities where they purchased wildlife products. Amplification of the campaign across Africa and Asia as other airlines and tourism, travel, transporting companies, freighting and shipping agencies, join the campaign and carry the same messages across East Africa. Regional successes in combating wildlife crime through citizen and corporate support for government policies. The invited the guests included John Heminway - Chairman of Wildlife Direct, Ali Mohamed and Philip Murgor - Directors of Wildlife Direct, Dr. Paula Kahumbu - CEO Wildlife Direct, Shaun Barretto - General Manager, Phoenix Aviation who have shared the cost of the branding, amongst others. Wildlife Direct is also involved with supporting legal reforms and the training of prosecutors and magistrates on wildlife crime, Partnering with UNDP to do outreach to communities in Amboseli area, Outreach through county events and partnering with the National Debate Council to bring these issues to the youth. Safarilink CSR activities remain focused on community initiatives, forest restoration, health and education projects, support to various conservation initiatives including, Lewa Wildlife Conservancy, Colobus Conservation Trust, Mt Kenya Trust, MEAK, amongst others. Safarilink is proud to be part of this successful campaign to preserve Kenya's unique wildlife heritage.